Total Movie Converter is a handy solution to convert video files of almost all popular video codecs to AVI, MPG, WMV, MPEG, FLV. In addition, Total Movie Converter is great for converting video for iPad, iPhone, Apple TV, Archos, XBox and others thanks to the new Video To Device feature. Our pricing is clear and concise. Once paid you get all the upgrades and free tech support. Hit Download button now to try it out for 30 days without any obligation. Why should you try it? Total Movie Converter is extremely simple. It is not overloaded with the features you will never use. But what it does it does perfectly - converts video files. "Eve got the new key you sent her. She loves Total Movie Converter as much as I do and I just gotta say this level of personalized product support is pretty rare on the internet these days. Ive tried other programs over the years but TMC is the only one where you just have to go click, click and it converts! Never mind the fact that ALL the rest choke on .m2vs." 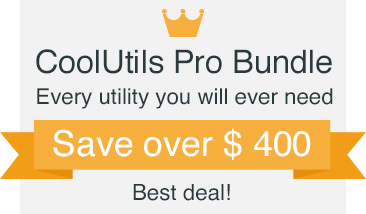 "So far the video converter is great, so easy for me to use. I am not that PC savvy so any program which makes things simple and easy is what I look for. Once I use it more, will be happy to give some constructive feedback. Thus far all good. Thanks and regards." "We use the tool through command line in order to make a fully automated conversion of .AVI to .MP4. We do not use the desktop interface. We record machine in production. In case of issue, we want to send the movie to the customer / supplier. The tool allow us to reduce the movie size in order to send them trough email. The good point is the conversion process rate which is incredible." "It went smoothly enough and I am quite happy with the output video file. It's a good movie converter to mp4 converter!" If you are looking for a high quality video conversion, Total Movie Converter is at your fingertips! Unlike any other free video converter, this one is paid (just $29.90!) but is worth every penny. You get the new file fast and enjoy your favorite videos on any device you like. Download and install the app, select your video file (one movie or a folder with 100 movies), then press the output file format button. Choose AVI, MPG, WMV, MPEG, or FLV. The wizard will help you with all your settings. Choose the destination folder. Here you can combine all videos into one file, just check the checkbox for that. 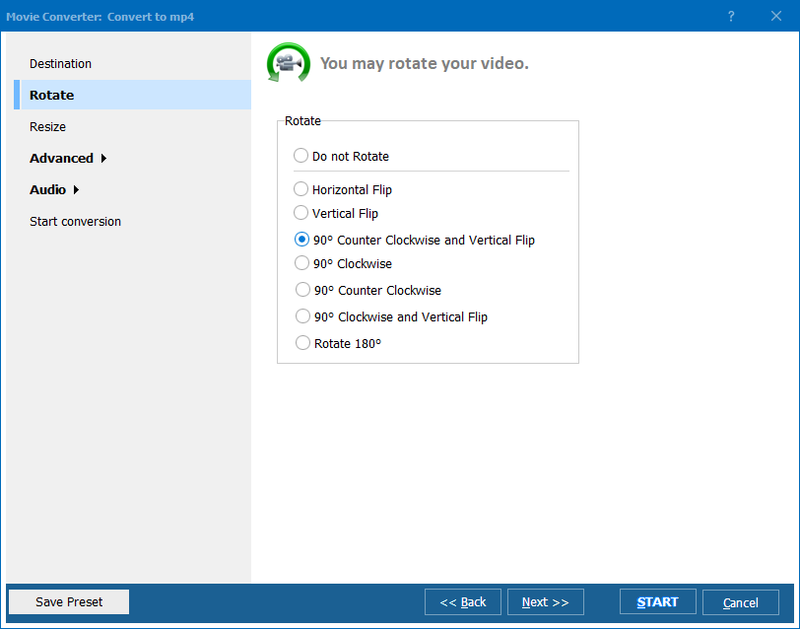 You can resize your video or rotate it if you need. Alternatively, you can skip these settings and press Start button. 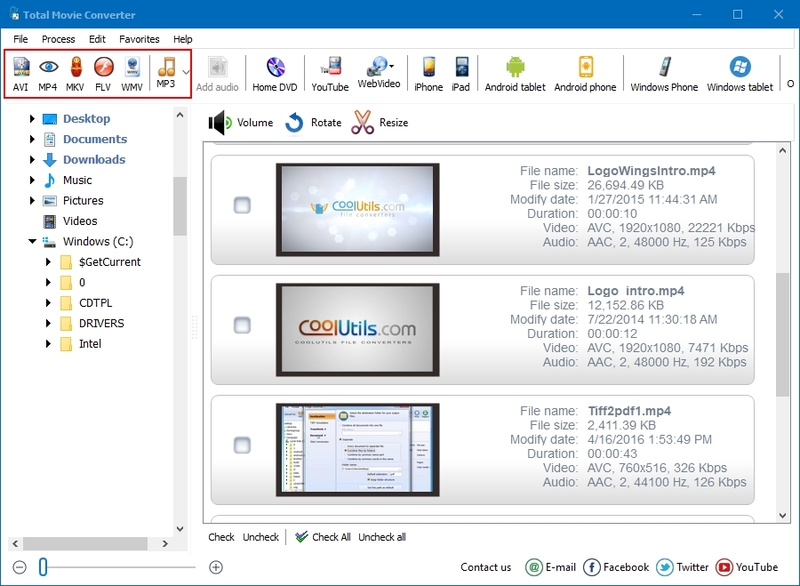 When the conversion is done, the app will open Explorer windows with your new video files. Enjoy! Convert video to iPad without any problems. Resize AVI Video without any problems. Resize WMV Video for less money. Find Video for xBox without any problems. Why is DivX video so popular today? How to choose the best codec for Video? How to use Two-pass Encoding with ease and smile? Input formats: AVI, WMV, DIVX, VOB, MOV, MPEG, MPEG4, ASF, AVS, IVF, MKV, 3GP, HD, MOD, NSV, FLI, MTS, Telesync.